This document provides OCCT developers and contributors with an overview and practical guidelines for work with OCCT automatic testing system. Reading the Introduction should be sufficient for developers to use the test system to control non-regression of the modifications they implement in OCCT. Other sections provide a more in-depth description of the test system, required for modifying the tests and adding new test cases. OCCT automatic testing system is organized around DRAW Test Harness, a console application based on Tcl (a scripting language) interpreter extended by OCCT-related commands. Standard OCCT tests are included with OCCT sources and are located in subdirectory tests of the OCCT root folder. Other test folders can be included in the test system, e.g. for testing applications based on OCCT. Test case: a script implementing an individual test (e.g. K4). See Test Groups chapter for the current list of available test groups and grids. Many tests involve data files (typically CAD models) which are located separately and (except a few) are not included with OCCT code. These tests will be skipped if data files are not available. Each modification made in OCCT code must be checked for non-regression by running the whole set of tests. The developer who makes the modification is responsible for running and ensuring non-regression for the tests available to him. Note that many tests are based on data files that are confidential and thus available only at OPEN CASCADE. The official certification testing of each change before its integration to master branch of official OCCT Git repository (and finally to the official release) is performed by OPEN CASCADE to ensure non-regression on all existing test cases and supported platforms. Each new non-trivial modification (improvement, bug fix, new feature) in OCCT should be accompanied by a relevant test case suitable for verifying that modification. This test case is to be added by the developer who provides the modification. If a modification affects the result of an existing test case, either the modification should be corrected (if it causes regression) or the affected test cases should be updated to account for the modification. The modifications made in the OCCT code and related test scripts should be included in the same integration to the master branch. Before running tests, make sure to define environment variable CSF_TestDataPath pointing to the directory containing test data files. For this it is recommended to add a file DrawAppliInit in the directory which is current at the moment of starting DRAWEXE (normally it is OCCT root directory, $CASROOT ). This file is evaluated automatically at the DRAW start. Note that variable CSF_TestDataPath is set to default value at DRAW start, pointing at the folder $CASROOT/data. In this example, subdirectory d:/occt/test-data is added to this path. Similar code could be used on Linux and Mac OS X except that on non-Windows platforms colon ":" should be used as path separator instead of semicolon ";". All tests are run from DRAW command prompt (run draw.bat or draw.sh to start it). To run only a subset of test cases, give masks for group, grid, and test case names to be executed. Each argument is a list of file masks separated with commas or spaces; by default "*" is assumed. As the tests progress, the result of each test case is reported. At the end of the log a summary of test cases is output, including the list of detected regressions and improvements, if any. The tests are considered as non-regressive if only OK, BAD (i.e. known problem), and SKIPPED (i.e. not executed, typically because of lack of a data file) statuses are reported. See Interpretation of test results for details. The results and detailed logs of the tests are saved by default to a new subdirectory of the subdirectory results in the current folder, whose name is generated automatically using the current date and time, prefixed by Git branch name (if Git is available and current sources are managed by Git). If necessary, a non-default output directory can be specified using option -outdir followed by a path to the directory. This directory should be new or empty; use option -overwrite to allow writing results in the existing non-empty directory. In the output directory, a cumulative HTML report summary.html provides links to reports on each test case. An additional report in JUnit-style XML format can be output for use in Jenkins or other continuous integration system. To re-run the test cases, which were detected as regressions on the previous run, option -regress dirname should be used. dirname is a path to the directory containing the results of the previous run. Only the test cases with FAILED and IMPROVEMENT statuses will be tested. -regress dirname: re-run only a set of tests that have been detected as regressions on the previous run. Here "dirname" is a path to the directory containing the results of the previous run. masks separated by spaces or commas; default is all (*). To run a single test, type command test followed by names of group, grid, and test case. Note that normally an intermediate output of the script is not shown. The detailed log of the test can be obtained after the test execution by running command "dlog get". To see intermediate commands and their output during the test execution, add one more argument "echo" at the end of the command line. Note that with this option the log is not collected and summary is not produced. It is also possible to use "1" instead of "-echo"
in html file(with snapshot), for that "filename"
This key will be ignored if the "-echo" key is already set. Use prefix bug followed by Mantis issue ID and, if necessary, additional suffixes, for naming the test script, data files, and DRAW commands specific for this test case. If the test requires C++ code, add it as new DRAW command(s) in one of files in QABugs package. Add script(s) for the test case in the subfolder corresponding to the relevant OCCT module of the group bugs ($CASROOT/tests/bugs). See the correspondence map. Load all necessary DRAW modules by command pload. Use DRAW commands to reproduce the tested situation. Make sure that in case of failure the test produces a message containing word "Error" or other recognized by the test system as error (add new error patterns in file parse.rules if necessary). If the test case reports error due to an existing problem and the fix is not available, add TODO statement for each error to mark it as a known problem. The TODO statements must be specific so as to match the actually generated messages but not all similar errors. To check expected output which should be obtained as the test result, add REQUIRED statement for each line of output to mark it as required. If the test case produces error messages (contained in parse.rules), which are expected in that test and should not be considered as its failure (e.g. test for checkshape command), add REQUIRED statement for each error to mark it as required output. To check whether the data files needed for the test are already present in the database, use DRAW command testfile (see below). If the data file is already present, use it for a new test instead of adding a duplicate. If the data file(s) are not yet present in the test database, put them to a folder and add it to the environment variable CSF_TestDataPath to be found by the test system. The location of the data files, which need to be accessed by OCC team and put to the official database, should be provided in the comment to Mantis issue, clearly indicating how the names of the files used by the test script match the actual names of the files. The simplest way is to attach the data files to the Mantis issue, with the same names as used by the test script. Check that the test case runs as expected (test for fix: OK with the fix, FAILED without the fix; test for existing problem: BAD), and integrate it to the Git branch created for the issue. 1 puts "OCC210 (case 1): Improve FixShape for touching wires"
consider removing them unless they are needed for the test! Standard OCCT tests are located in subdirectory tests of the OCCT root folder ($CASROOT). Additional test folders can be added to the test system by defining environment variable CSF_TestScriptsPath. This should be list of paths separated by semicolons (*;*) on Windows or colons (*:*) on Linux or Mac. Upon DRAW launch, path to tests subfolder of OCCT is added at the end of this variable automatically. One or several test group directories. File grids.list that identifies this test group and defines list of test grids in it. Test grids (sub-directories), each containing set of scripts for test cases, and optional files cases.list, parse.rules, begin and end. By convention, names of test groups, grids, and cases should contain no spaces and be lower-case. The names begin, end, data, parse.rules, grids.list and cases.list are reserved. 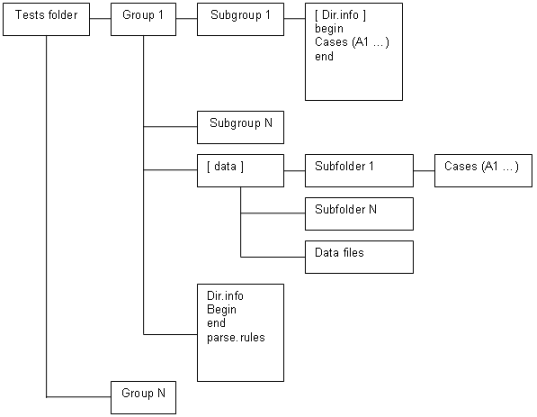 General layout of test scripts is shown in Figure 1. The names of directories of test groups containing systematic test grids correspond to the functionality tested by each group. Test group bugs is used to collect the tests coming from bug reports. Group demo collects tests of the test system, DRAW, samples, etc. This file is a Tcl script. It is executed before every test in the current group. Usually it loads necessary Draw commands, sets common parameters and defines additional Tcl functions used in test scripts. This file is a TCL script. It is executed after every test in the current group. Usually it checks the results of script work, makes a snap-shot of the viewer and writes TEST COMPLETED to the output. Note: TEST COMPLETED string should be present in the output to indicate that the test is finished without crash. See Creation and modification of tests chapter for more information. puts "Error: The result shape can not be built"
The test group may contain parse.rules file. This file defines patterns used for analysis of the test execution log and deciding the status of the test run. Each line in the file should specify a status (single word), followed by a regular expression delimited by slashes (*/*) that will be matched against lines in the test output log to check if it corresponds to this status. The regular expressions should follow Tcl syntax, with a special exception that "\b" is considered as word limit (Perl-style), in addition to "\y" used in Tcl. The rest of the line can contain a comment message, which will be added to the test report when this status is detected. Lines starting with a *#* character and blank lines are ignored to allow comments and spacing. See Interpretation of test results chapter for details. If a line matches several rules, the first one applies. Rules defined in the grid are checked first, then rules in the group, then rules in the test root directory. This allows defining some rules on the grid level with status IGNORE to ignore messages that would otherwise be treated as errors due to the group level rules. The test group may contain subdirectory data, where test scripts shared by different test grids can be put. See also Directory data. The folder of a test group can have several sub-directories (Grid 1… Grid N) defining test grids. Each directory contains a set of related test cases. The name of a directory should correspond to its contents. Here caf is the name of the test group and basic, bugs, presentation, etc. are the names of grids. This file is a TCL script executed before every test in the current grid. Usually it sets variables specific for the current grid. This file is a TCL script executed after every test in current grid. Usually it executes a specific sequence of commands common for all tests in the grid. The grid directory can contain an optional file cases.list defining an alternative location of the test cases. This file should contain a single line defining the relative path to the collection of test cases. This option is used for creation of several grids of tests with the same data files and operations but performed with differing parameters. The common scripts are usually located place in the common subdirectory of the test group, data/simple for example. If file cases.list exists, the grid directory should not contain any test cases. The specific parameters and pre- and post-processing commands for test execution in this grid should be defined in the files begin and end. The test grid may contain subdirectory data, containing data files used in tests (BREP, IGES, STEP, etc.) of this grid. The test case is a TCL script, which performs some operations using DRAW commands and produces meaningful messages that can be used to check the validity of the result. The test case can have any name (except for the reserved names begin, end, data, cases.list and parse.rules). For systematic grids it is usually a capital English letter followed by a number. Such naming facilitates compact representation of tests execution results in tabular format within HTML reports. This section describes how to add new tests and update existing ones. The new tests are usually added in the frame of processing issues in OCCT Mantis tracker. Such tests in general should be added to group bugs, in the grid corresponding to the affected OCCT functionality. See Mapping of OCCT functionality to grid names in group bugs. New grids can be added as necessary to contain tests for the functionality not yet covered by existing test grids. The test case name in the bugs group should be prefixed by the ID of the corresponding issue in Mantis (without leading zeroes) with prefix bug. It is recommended to add a suffix providing a hint on the tested situation. If more than one test is added for a bug, they should be distinguished by suffixes; either meaningful or just ordinal numbers. If the new test corresponds to a functionality already covered by the existing systematic test grid (e.g. group mesh for BRepMesh issues), this test can be added (or moved later by OCC team) to that grid. It is advisable to make self-contained test scripts whenever possible, so as they could be used in the environments where data files are not available. For that simple geometric objects and shapes can be created using DRAW commands in the test script itself. If the test requires a data file, it should be put to the directory listed in environment variable CSF_TestDataPath. Alternatively, it can be put to subdirectory data of the test grid. It is recommended to prefix the data file with the corresponding issue id prefixed by bug, e.g. bug12345_face1.brep, to avoid possible conflicts with names of existing data files. Note that when the test is integrated to the master branch, OCC team will move the data file to the data files repository, to keep OCCT sources repository clean from data files. When you prepare a test script, try to minimize the size of involved data model. For instance, if the problem detected on a big shape can be reproduced on a single face extracted from that shape, use only that face in the test. If the existing DRAW command can be extended to enable possibility required for a test in a natural way (e.g. by adding an option to activate a specific mode of the algorithm), this way is recommended. This change should be appropriately documented in a relevant Mantis issue. If the new command is needed to access OCCT functionality not exposed to DRAW previously, and this command can be potentially reused (for other tests), it should be added to the package where similar commands are implemented (use getsource DRAW command to get the package name). The name and arguments of the new command should be chosen to keep similarity with the existing commands. This change should be documented in a relevant Mantis issue. Otherwise the new command implementing the actions needed for this particular test should be added in QABugs package. The command name should be formed by the Mantis issue ID prefixed by bug, e.g. bug12345. Note that a DRAW command is expected to return 0 in case of a normal completion, and 1 (Tcl exception) if it is incorrectly used (e.g. a wrong number of input arguments). Thus if the new command needs to report a test error, this should be done by outputting an appropriate error message rather than by returning a non-zero value. File names must be encoded in the script rather than in the DRAW command and passed to the DRAW command as an argument. The test should run commands necessary to perform the tested operations, in general assuming a clean DRAW session. The required DRAW modules should be loaded by pload command, if it is not done by begin script. The messages produced by commands in a standard output should include identifiable messages on the discovered problems if any. Usually the script represents a set of commands that a person would run interactively to perform the operation and see its results, with additional comments to explain what happens. Make sure that file parse.rules in the grid or group directory contains a regular expression to catch possible messages indicating the failure of the test. For the messages generated in the script it is recommended to use the word 'Error' in the error message. puts "Error: The length of the edge should be $expected_length"
At the end, the test script should output TEST COMPLETED string to mark a successful completion of the script. This is often done by the end script in the grid. When the test script requires a data file, use Tcl procedure locate_data_file to get a path to it, instead of putting the path explicitly. This will allow easy move of the data file from OCCT sources repository to the data files repository without the need to update the test script. When the test needs to produce some snapshots or other artefacts, use Tcl variable imagedir as the location where such files should be put. Command testgrid sets this variable to the subdirectory of the results folder corresponding to the grid. Command test by default creates a dedicated temporary directory in the system temporary folder (normally the one specified by environment variable TempDir, TEMP, or TMP) for each execution, and sets imagedir to that location. However if variable imagedir is defined on the top level of Tcl interpretor, command test will use it instead of creating a new directory. Use Tcl variable casename to prefix all files produced by the test. This variable is set to the name of the test case. The test system can recognize an image file (snapshot) and include it in HTML log and differences if its name starts with the name of the test case (use variable casename), optionally followed by underscore or dash and arbitrary suffix. The image format (defined by extension) should be png. Note that OCCT must be built with FreeImage support to be able to produce usable images. dirname: path to the root directory of the current set of test scripts. Avoid using external commands such as grep, rm, etc., as these commands can be absent on another system (e.g. on Windows); use facilities provided by Tcl instead. Do not put call to locate_data_file in catch statement – this can prevent correct interpretation of the missing data file by the test system. Do not use commands decho and dlog in the test script, to avoid interference with use of these commands by the test system. The result of the test is evaluated by checking its output against patterns defined in the files parse.rules of the grid and group. SKIPPED: reported if a line matching SKIPPED pattern is found (prior to any FAILED pattern). This indicates that the test cannot be run in the current environment; the most typical case is the absence of the required data file. FAILED: reported if a line matching pattern with status FAILED is found (unless it is masked by the preceding IGNORE pattern or a TODO or REQUIRED statement), or if message TEST COMPLETED or at least one of REQUIRED patterns is not found. This indicates that the test has produced a bad or unexpected result, and usually means a regression. BAD: reported if the test script output contains one or several TODO statements and the corresponding number of matching lines in the log. This indicates a known problem. The lines matching TODO statements are not checked against other patterns and thus will not cause a FAILED status. IMPROVEMENT: reported if the test script output contains a TODO statement for which no corresponding line is found. This is a possible indication of improvement (a known problem has disappeared). OK: reported if none of the above statuses have been assigned. This means that the test has passed without problems. Other statuses can be specified in parse.rules files, these will be classified as FAILED. For integration of the change to OCCT repository, all tests should return either OK or BAD status. The new test created for an unsolved problem should return BAD. The new test created for a fixed problem should return FAILED without the fix, and OK with the fix. If the test produces an invalid result at a certain moment then the corresponding bug should be created in the OCCT issue tracker located at http://tracker.dev.opencascade.org, and the problem should be marked as TODO in the test script. puts "TODO BugNumber ListOfPlatforms: RegularExpression"
BugNumber is the bug ID in the tracker. For example: #12345. ListOfPlatforms is a list of platforms, at which the bug is reproduced (Linux, Windows, MacOS, or All). Note that the platform name is custom for the OCCT test system; Use procedure checkplatform to get the platform name. RegularExpression is a regular expression, which should be matched against the line indicating the problem in the script output. puts "TODO #22622 Mandriva2008: Abort . * an exception was raised"
The parser checks the test output and if an output line matches the RegularExpression then it will be assigned a BAD status instead of FAILED. A separate TODO line must be added for each output line matching an error expression to mark the test as BAD. If not all TODO messages are found in the test log, the test will be considered as possible improvement. To mark the test as BAD for an incomplete case (when the final TEST COMPLETE message is missing) the expression TEST INCOMPLETE should be used instead of the regular expression. puts "TODO OCC22817 All: exception.+There are no suitable edges"
puts "TODO OCC22817 All: \\*\\* Exception \\*\\*"
puts "TODO OCC22817 All: TEST INCOMPLETE"
Here ListOfPlatforms and RegularExpression have the same meaning as in TODO statements described above. The REQUIRED statement can also be used to mask the message that would normally be interpreted as error (according to the rules defined in parse.rules) but should not be considered as such within the current test. puts "REQUIRED Linux: Faulty shapes in variables faulty_1 to faulty_5"
This statement notifies test system that errors reported by checkshape command are expected in that test case, and test should be considered as OK if this message appears, despite of presence of general rule stating that 'Faulty' signals failure. If output does not contain required statement, test case will be marked as FAILED. Sometimes it might be necessary to run tests on the previous versions of OCCT (<= 6.5.4) that do not include this test system. This can be done by adding DRAW configuration file DrawAppliInit in the directory, which is current by the moment of DRAW start-up, to load test commands and to define the necessary environment. Note: in OCCT 6.5.3, file DrawAppliInit already exists in $CASROOT/src/DrawResources, new commands should be added to this file instead of a new one in the current directory. Note that on older versions of OCCT the tests are run in compatibility mode and thus not all output of the test command can be captured; this can lead to absence of some error messages (can be reported as either a failure or an improvement). You can extend the test system by adding your own tests. For that it is necessary to add paths to the directory where these tests are located, and one or more additional data directories, to the environment variables CSF_TestScriptsPath and CSF_TestDataPath. The recommended way for doing this is using DRAW configuration file DrawAppliInit located in the directory which is current by the moment of DRAW start-up. Use Tcl command _path_separator to insert a platform-dependent separator to the path list. For better efficiency, on computers with multiple CPUs the tests can be run in parallel mode. This is default behavior for command testgrid : the tests are executed in parallel processes (their number is equal to the number of CPUs available on the system). In order to change this behavior, use option parallel followed by the number of processes to be used (1 or 0 to run sequentially). Note that the parallel execution is only possible if Tcl extension package Thread is installed. If this package is not available, testgrid command will output a warning message. Some test results are very dependent on the characteristics of the workstation, where they are performed, and thus cannot be checked by comparison with some predefined values. These results can be checked for non-regression (after a change in OCCT code) by comparing them with the results produced by the version without this change. The most typical case is comparing the result obtained in a branch created for integration of a fix (CR***) with the results obtained on the master branch before that change is made. OCCT test system provides a dedicated command testdiff for comparing CPU time of execution, memory usage, and images produced by the tests. Here dir1 and dir2 are directories containing logs of two test runs. Particular tests can generate additional data that need to be compared by testdiff command. For that, for each parameter to be controlled, the test should produce the line containing keyword "COUNTER* followed by arbitrary name of the parameter, then colon and numeric value of the parameter. puts "COUNTER Memory heap usage at step 5: [meminfo h]"
This group allows testing the interaction of OCCT and 3rdparty products. This group allows testing blends (fillets) and related operations. This group allows testing Boolean operations. DRAW module: MODELING (packages BOPTest and BRepTest). _complex – for tests dealing with complex shapes. This group allows testing cases coming from Mantis issues. The grids are organized following OCCT module and category set for the issue in the Mantis tracker. See Mapping of OCCT functionality to grid names in group bugs chapter for details. This group allows testing OCAF functionality. This group allows testing chamfer operations. The test grid name is constructed depending on the type of the tested chamfers. Additional suffix _complex is used for test cases involving complex geometry (e.g. intersections of edges forming a chamfer); suffix _sequence is used for grids where chamfers are computed sequentially. This group allows demonstrating how testing cases are created, and testing DRAW commands and the test system as a whole. This group allows testing draft operations. This group allows testing creation of features on a shape. DRAW module: MODELING (package BRepTest). This group allows testing the functionality provided by ShapeHealing toolkit. This group allows testing shape tessellation (BRepMesh) and shading. This group allows testing creation of simple surfaces. This group allows testing normal projection of edges and wires onto a face. This group allows testing offset functionality for curves and surfaces. This group allows testing construction of pipes (sweeping of a contour along profile). This group allows testing construction of prisms. This group allows testing sewing of faces by connecting edges. This group allows testing construction of shell or a solid passing through a set of sections in a given sequence (loft). This group allows testing extended data exchange packages. dxc, dxc_add_ACL, dxc_add_CL, igs_to_dxc, igs_add_ACL, brep_to_igs_add_CL, stp_to_dxc, stp_add_ACL, brep_to_stp_add_CL, brep_to_dxc, add_ACL_brep, brep_add_CL Subgroups are divided by format of source file, by format of result file and by type of document modification. For example, brep_to_igs means that the source shape in brep format was added to the document, which was saved into igs format after that. The postfix add_CL means that colors and layers were initialized in the document before saving and the postfix add_ACL corresponds to the creation of assembly and initialization of colors and layers in a document before saving. Run command checkshape on the result (or intermediate) shape and make sure that parse.rules of the test grid or group reports bad shapes (usually recognized by word "Faulty") as error. To check the number of faults in the shape command checkfaults can be used. It is possible to use command checkmaxtol to check maximal tolerance of shape and compare it with reference value. If the value of maximum tolerance more than founded tolerance for comparison, the command will return an error. Use command vprops, sprops, or lprops to correspondingly measure volume, area, or length of the shape produced by the test. The value can be extracted from the result of the command by regexp. puts "Error: The area of result shape is $area, while expected $expected"
The test system measures the amount of memory used by each test case. Considerable deviations (as well as the overall difference) in comparison with reference results can be reported by command testdiff (see Checking non-regression of performance, memory, and visualization). To check memory leak on a particular operation, run it in a cycle, measure the memory consumption at each step and compare it with a threshold value. The command checktrend (defined in tests/bugs/begin) can be used to analyze a sequence of memory measurements and to get a statistically based evaluation of the leak presence. puts "No memory leak, $i iterations"
The following command sequence allows you to take a snapshot of the viewer, give it the name of the test case, and save in the directory indicated by Tcl variable imagedir. This image will be included in the HTML log produced by testgrid command and will be checked for non-regression through comparison of images by command testdiff. Also it is possible to use command checkview to make a snapshot of the viewer. If the current property is equal to value N, the shape is marked as valid in the procedure. If value N is not given, the procedure will mark the shape as valid if the current property is non-zero. Note that is required to use either option -2d or option -3d. Procedure checkfreebounds compares the number of free edges with a reference value. -type N – used type, possible values are "closed" and "opened" (default "closed"). Option -tol N defines tolerance for command freebounds, which is used within command checkfreebounds. Option -type N is used to select the type of counted free edges: closed or open. Procedure checkreal checks the equality of two reals with a tolerance (relative and absolute). Procedure checknbshapes compares the number of sub-shapes in "shape" with the given reference data. -t – compares the number of sub-shapes in "shape" counting the same sub-shapes with different location as different sub-shapes. Command checkcolor can be used to check pixel color. red green blue – expected pixel color (values from 0 to 1). This procedure checks color with tolerance (5x5 area). Procedure checkprops computes length, area and volume of the input shape. -notequal SHAPE – compares area, volume and length of input shapes. Puts error if they are equal. Options -l, -s and -v are independent and can be used in any order. Tolerance epsilon is the same for all options. Procedure checkdump is used to parse output dump and compare it with reference values. -eps EPSILON – the epsilon defines relative precision of computation. Procedure checklength computes length of the input curve. -notequal CURVE – compares the length of input curves. Puts error if they are equal. Command checktrinfo can be used to to check the maximum deflection, as well as the number of nodes and triangles in mesh. -tri [N] – compares the current number of triangles in shapename mesh with the given reference data. If reference value N is not given and the current number of triangles is equal to 0, procedure checktrinfo will print an error. -nod [N] – compares the current number of nodes in shapename mesh with the given reference data. If reference value N is not given and the current number of nodes is equal to 0, procedure checktrinfo will print an error. -defl [N] – compares the current value of maximum deflection in shapename mesh with the given reference data. If reference value N is not given and current maximum deflection is equal to 0, procedure checktrinfo will print an error. -max_defl N – compares the current value of maximum deflection in shapename mesh with the max possible value. -tol_abs_tri N – absolute tolerance for comparison of number of triangles (default value 0). -tol_rel_tri N – relative tolerance for comparison of number of triangles (default value 0). -tol_abs_nod N – absolute tolerance for comparison of number of nodes (default value 0). -tol_rel_nod N – relative tolerance for comparison of number of nodes (default value 0). -tol_abs_defl N – absolute tolerance for deflection comparison (default value 0). -tol_rel_defl N – relative tolerance for deflection comparison (default value 0). -ref [trinfo a] – compares deflection, number of triangles and nodes in shapename and a. Note that options -tri, -nod and -defl do not work together with option -ref. It is possible to compare current values with reference values with some tolerances. Use options -tol_* for that.